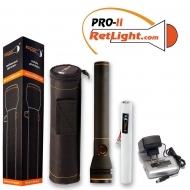 In this page You can find and purchase the most popular today light sets RetLight™ PRO-2 is already equipped with everything necessary for maximum comfort in use. Sets of different color temperature of light. The duration of operation at maximum brightness the sets RetLight™PRO-2 is 3 hours, which is the highest rate among all devices RetLight™. You can also contact us with any question on the kit that you are interested by sending a request in the feedback form.